Confession: I don’t LOVE kale. I like the flavor a lot, but the texture is one that likes to tickle the inside of my mouth and tends to be a bit sharp going down, and kinda makes me gag (if I’m being truthful). But because kale is so incredibly healthy and affordable, I love to find creative ways to eat it that are both delicious and nutritious! And in the form of cheesy goodness, I figured Mr. Prevention would be a taker, too. Right I was. Unfortunately, he turned my beautiful gratin into a chip ‘n’ dip delight. What am I going to do with him? One cup of kale provides 1328% your daily value of Vitamin K and almost 200% the daily value for Vitamin A. It is also high in Vitamin C, fiber, and omega 3’s. Containing over 45 flavanoids, kale is an anti-cancer vegetable topping the charts, and here’s just one delicious way to enjoy it…two ways if “on a chip” counts. According to Mr. P, it most certainly does. Preheat oven to 375° F; grease a medium-sized gratin dish (I used a casserole dish) with butter. In a large, deep-sided pan with a lid, heat oil over medium heat; once hot, add garlic and sauté 30 seconds. Add 1 cup water, turn heat up to between medium-high and high, and add kale. Add 1/3 tsp salt and 1/8 tsp pepper; cover pan and cook 5 minutes, stirring occasionally. Drain greens to remove water; put greens back into the pan they were cooked in. Mix shredded cheeses together; set aside 1/2 1/3 cup to use as topping. In a medium saucepan over medium heat, melt butter; whisk in flour and cook 1 minute. Whisk in milk and a pinch freshly grated nutmeg; bring up to a boil, then turn heat down and simmer 1 minute. Turn off heat and whisk in shredded cheeses, except reserved 1/2 1/3 cup for topping. 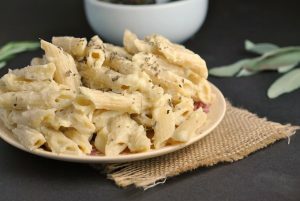 Taste cheese sauce and add salt and pepper as desired. Pour cheese sauce onto greens and stir to combine. 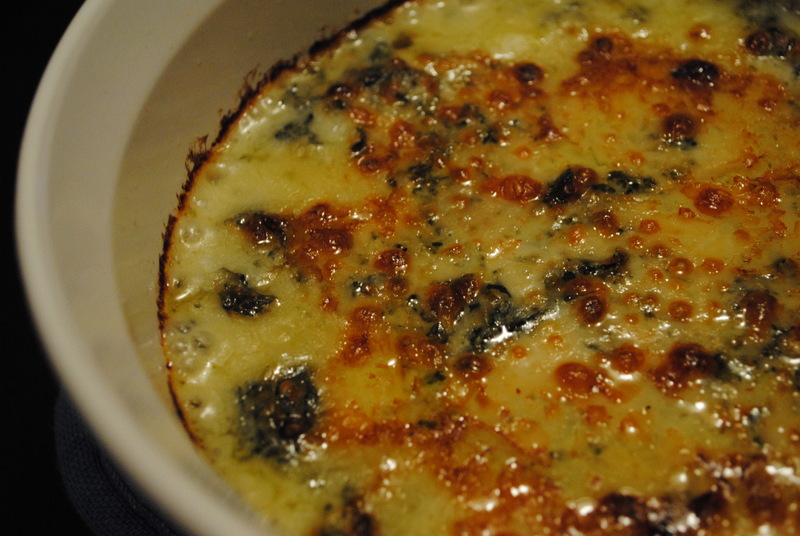 Transfer greens and sauce to prepared gratin dish and spread out in an even layer; top with reserved 1/2 1/3 cup cheese. Bake 20 minutes until cheese bubbles. Preheat broiler and broil a couple minutes until cheese is browned in spots. To Reheat: Preheat oven to 350F. Cover gratin with aluminum foil and bake until warmed throughout and bubbling on the edges. Serves 6. Result: Yum! This was über rich and delicious! It’s hard to believe there are 8 CUPS of kale in the recipe…it cooked down to nothing! Next time, I think I’ll add an additional 3-4 cups of kale just to increase the nutrition with all the cheese…there was plenty to go around! Another HUGE thumbs up for Faith’s recipes! Renee of My Kitchen Adventures: My question is about vitamin D — how much do we really need and is it true most people are deficient? This is a hot topic right now! Prevention RD: Hot topic, indeed! Increasing amounts of research are surfacing in support of vitamin D and its anti-cancer and anti-diabetic properties, among other things (MS, for one). The tolerable upper limit (UL) is 2,000 IU for people over the age of 14. Unless you are consuming a TON of cod liver oil, sockeye salmon, mackerel, or Vitamin D-fortified milk, one is not at great risk for too much vitamin D. However, vitamin D is a fat-soluble vitamin meaning it can be consumed in excess and cause toxicity. My recommendation for milk drinkers (in any form) is to find a milk or milk substitute which is vitamin D-fortified. For most individuals consuming a diet that is not exceptionally high in vitamin D (foods noted above), a supplement of 200 IU’s (up to 400 IU’s for vegetarians and vegans) is safe and appropriate*. The Adequate Intake (AI) for vitamin D is 200 IU’s for those 19-50 years of age, 400 IU’s for those 51-70 years of age, and 600 IU’s for those 71+ years of age. While diagnosed deficiency is not common (think rickets), vitamin D plays an integral role in bone health and research is showing more and more that more vitamin D (up to the UL) can provide potential health benefits without associated risks. For what it’s worth, I take a 200 IU vitamin D supplement daily. *This is a broad, general recommendation appropriate for adults eating an “average” diet consisting of 200-ish IU’s of vitamin D.
Samantha of Bikini Birthday: I’m not sure if you read “Weighty Matters”, a Canadian based blog about obesity. In a recent post on Weighty Matters, Dr. Freedhoff questions whether the Heart and Stroke Foundation’s endorsement of certain fast food restaurant meals through their Health Check program is hypocritical or beneficial to the restaurant-going public. I was wondering what your thoughts are on the matter. Tiffany of We Are Wedes: Can you explain to me Kefir, what exactly it is, and what it is used for. So far I’ve used it in smoothies (it’s delicious!) but a friend of mine says I can use it as a buttermilk substitute in cakes and other yummy treats. Is this true? Or will I destroy my yummy edible Christmas confections? Prevention RD: Mmm…Kefir! Kefir is cultured milk made from the introduction of kefir grains into raw milk. Kefir has added fiber (inulin) and is described as a cultured probiotic milk smoothie. Kefir is known for its probiotic benefits, containing 12 live and active strains of bacterium (most yogurts contain 2-3 strains) at 7-10 billion CFU’s (colony forming units) per serving. Pribiotics are found to keep the gut and intestinal tract healthy and functioning properly, as well as help prevent infection and illness. Generally speaking, Kefir can be substituted for buttermilk without issues. If the pH of the Kefir differs from that of buttermilk, the leavening in baked good will flop. Good question! Question: Do you feel that it is hypocritical for a dietitian to endorse restaurant dining, albeit healthier options? Absolutely not! Restaurants are real world and you can’t be real with people unless you talk about them and can help out by endorsing some good options. Otherwise I make my own decision, which likely is very, very bad :). I only like kale chips, but this looks SO good to me!! Oh my gosh, that looks SO good and cheesy!!! Yum, yum! The only way I’ve eaten kale is kale chips–this gratin sounds delish though! Cheesy goodness. I bet this could get a lot of people turned on to kale! It’s kinda of like a creamy spinach dip, but with kale. Yum! That dish looks so yummy Nicole! I love how cheesy it looks! Back in August, I started feeling very light-headed/dizzy and had absolutely no energy. It was lasting for almost a month, so I went to the doctor– I thought it could have been mono or almost even diabetes. After blood work, it showed that I had a Vitamin D deficiency. I take a multivitamin plus a Vitamin D supplement, and I can tell a world of difference. If I forget to take it, a few days later I will start feeling like I did before! I actually really enjoy kale, but don’t eat it often enough. 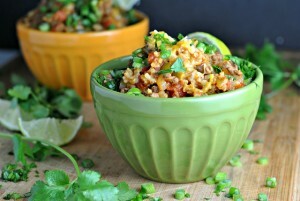 This recipe looks good and something I could get the Husband to eat! I have yet to try kale even though most bloggers promise kale chips are amazing. Though I have a feeling that if I try it I’ll make your recipe. It looks like spinach dip. Oh my goodness–yum! Oh, and I think it’d be irresponsible for an RD to assume everyone can cook at home. There are people who work five jobs who are going to eat out no matter what. Giving recommendations on the best dishes is important! Plus, there are people who physically can’t cook because of illness or disability. These things are important, even if home cooking is healthier. Sometimes it’s easy to forget that the majority of people don’t view food as bloggers do. Any help is worth it! 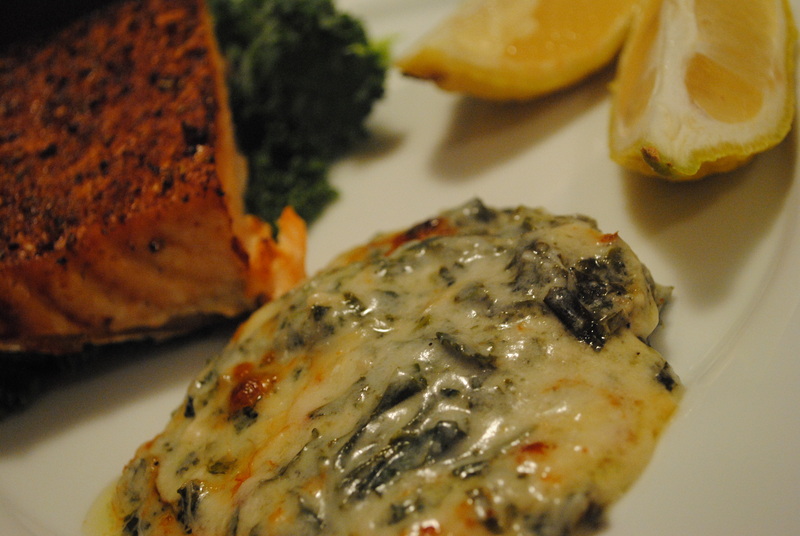 I’m so glad you liked the Kale Gratin! 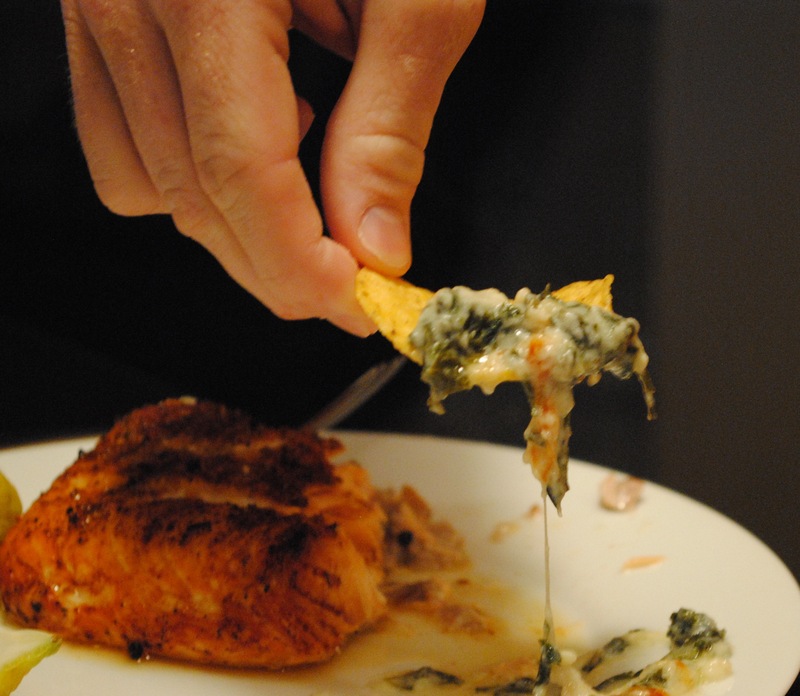 And I love Mr. P’s chips and dip idea, it is a little reminiscent of a spinach/artichoke dip, lol! Thanks for the info on kefir, I’ve been thinking of using it! Your comments about the restaurant dining are spot on! Ignorance is NOT bliss!! You are right! I absolutely think that Americans need a wake up call. While we can’t expect people to switch on a light and be the “perfect” eaters, we need them to meet us halfway and be willing to make small changes that build to bigger change. I think putting nutritional info on menus is necessary and i’m going to read those posts now! Thanks!! THANK YOU for answering my question!! I do take a Vit D supplement…and now I now just how much I should be taking! I think you said it right when you said in a “Perfect world.” We all know Perfect “anything” doesn’t exist, and should not be expected to exist. To be human is to be imperfect. Eating out is about so much more than the food. One should never be expected to give this up…but making better, smarter choices can actually shape the industry into providing the better choices on the menus. If no one buys the” triple double decker with triple cheese,” well then, they won’t be selling it for long. Not hypocritical at all. As RDs we tend to work with real life clients out in the real world and if you come up with things for them that have them making huge changes at all once, well you know as well as I do, that they probably will not stick with it and will likely not come back for a follow up appointment. Those people who have a problem with this are likely overly healthy without really knowing the hows and whys of balance. It is good to be healthy, but too a point, like making others uncomfortable in their own choices and expecting everyone to be comfortable spending tons of money for what you call healthy. There are plenty of ways to eat a healthy meal while dining out. Let’s face it, the majority of Americans dine out at some point, so why not educate them in a better way to go about this. I am not a fan of kale either, but I think you have a great recipe here. I like kale chips but I have a hard time eating a bunch at a time. I think kale is much better mixed with something…this dip looks great!! I love how you answered that question. It is like you took the words right out of my mouth. Eating isn’t all or nothing like you said! I tried making kale chips once, but almost gagged immediately they were so awful. But. . .if I mixed it in with my beloved cheese like you did – I may have to give it another go! Okay lady… now this is a way to eat kale that I would love! Thanks for sharing the recipe, it looks amazing! Last time I cooked with kale, I made kale chips. This dish looks pretty delicious! Hi, I have to thank you for this recipe! I just tried Kale for the first time, and fed it to my young kids, using your Kale au gratin recipe, and poured it over penne and sauted chicken. I admit I was skeptical that anyone would like it, but it was so delicious. THanks again!